Can you name this film from 2011? Use the “reply” link above. Cowriter and director George Clooney adapts author Robert M. Edsel’s book The Monuments Men: Allied Heroes, Nazi Thieves, and the Greatest Treasure Hunt in History to tell the incredible true story of the seven art historians and museum curators who went behind enemy lines during World War II on a mission to recover some of the world’s greatest works of art. As the Third Reich begins to topple, the German army receives explicit orders to destroy every work of art in their possession. Determined to prevent 1000 years of culture from going up in flames, American president Franklin D. Roosevelt assembles an unlikely task force comprised entirely of art experts to enter Germany, recover the works of art, and ensure they are returned to their rightful owners. With little knowledge of modern weapons or warfare tactics, the ragtag squadron successfully makes their way into enemy territory before realizing they’ve got their work cut out for them. Clooney, Cate Blanchett, Matt Damon, Bill Murray, John Goodman, and Jean Dujardin star. A city square will become the star of the small screen as film crews prepare to move in for the making of a magical new BBC drama. And the drama, based on the best-selling novel by Susanna Clarke, and boasting a seasoned cast of actors, will form the centre piece of the channel’s 2014 Christmas schedule. It tells the story of a time at the beginning of the 19th Century, when England no longer believes in practical magic. But Mr Norrell, of Hurtfew Abbey, stuns the city of York, when he brings the minster’s statues to life, and is then invited to London to help the government in the war against Napoleon. Jonathan Strange and Mr Norrell stars Eddie Marsan, of Best of Men, Ray Donovan and Filth fame, Olivier award-winning Bertie Carvel, known for roles in Restless, Hidden and Matilda, Paul Kaye, of Game of Thrones and Stella fame plus, Marc Warren from Hustle and Mad Dogs and Alice Englert, who starred in Ginger and Rosa and Beautiful Creatures. Ben Stephenson, controller of BBC drama commissioning, said: “We have secured the most original, talented and dynamic cast and team to produce this brand new adaptation of Susanna Clarke’s award-winning novel. Last night, at the 25th annual Producers Guild of America awards, this strange apparition appeared. Sherlock Holmes (as played by Robert Downey Jr.) met Sherlock Holmes (as played by Benedict Cumberbatch) at the Beverly Hilton Hotel. And while this was going on, PBS aired “The Empty Hearse,” the first episode of Season Three of Benedict’s Sherlock (recap here). That is a LOT of deduction in a short space of time. And there’s no sign of it letting up. Today, a spin-off iOS app, inviting fans to become part of Sherlock’s Homeless Network, was released in the U.K. The app will be released on January 27 in the U.S., and if you want to see more, read the review at Sherlockology. Aneurin Barnard (born 8 May 1987) is an award-winning Welsh stage and screen actor. Barnard was born in the former borough of Ogwr in Mid Glamorgan, Wales, the son of June, a factory worker, and Terry Barnard, a coal miner. He has a sister named Ceri. He attended Ysgol Gyfun Llanhari in South Wales during his secondary school years. He then trained at the Royal Welsh College of Music & Drama alongside Kimberley Nixon and Tom Cullen, graduating in 2008. His first language is Welsh. Barnard played Melchior, one of the three leads, in the London premiere of the Tony Award-winning musical Spring Awakening, which opened in February 2009 at the Lyric Hammersmith. The play later transferred to the Novello Theatre in March 2009, running until May 2009. Barnard won a Laurence Olivier Award for his role in Spring Awakening in 2010. He has appeared in guest roles in TV series Doctors, Casualty, Shameless, Y Pris and Jacob’s Ladder. He has also appeared in the short TV films The Big Day, Night on the Tiles and the BAFTA Cymru winning Owl Creek Bridge. His theatre work in Wales includes Singin’ in the Rain, playing Don Lockwood, for Bridgend County Youth Theatre and Il Miracolo for Elan Wales. At drama school, he appeared in productions of The Caucasian Chalk Circle, Hobson’s Choice, The Importance of Being Earnest and West Side Story, in which he played Tony. He was also involved in a radio production of Under Milk Wood. Barnard appeared in Ironclad, a film set in 1215 and featuring the signing of the Magna Carta by King John and the rebellion by his barons. The film also stars Paul Giamatti, Derek Jacobi, Kate Mara, James Purefoy, Jason Flemyng and Mackenzie Crook. In 2011 he starred in Hunky Dory alongside Minnie Driver. The film is set in 1976 during the hottest summer recorded, in a school in Swansea. Barnard played the role of Davy and in the film sang songs from the era such as David Bowie’s “Life on Mars” and The Who’s “Love Reign O’er Me”. In January 2012 he starred as photographer David Bailey in the BBC Four film “We’ll Take Manhattan” alongside Karen Gillan. He also appeared in the 2012 horror movie Elfie Hopkins alongside Jaime Winstone. Barnard was considered for the role of Jack in the 2013 film Jack the Giant Slayer, but was beaten to the part by Nicholas Hoult. Barnard then appeared in the lead role in Vertigo Films’s Guinea Pigs, also named The Facility an atmospheric, micro-budget horror film about volunteers fighting for their lives after a drug trial goes wrong. The film also stars Alex Reid, Chris Larkin, Steve Evets, Nia Roberts, Oliver Coleman, Skye Lourie, Jack Doolan and Amit Shah. Later in 2012 he starred in the horror-thriller film Citadel. In April–June 2012 he filmed the fantasy adventure movie Mariah Mundi and the Midas Box throughout the South West of England, playing the title role of Mariah Mundi. The movie is scheduled for release in 2013. Barnard also featured in Trap for Cinderella (2013) directed by Iain Softley which was based on the book by Sébastien Japrisot as well as portraying the character Claude in Francesca Gregorini’s drama thriller, Emanuel and the Truth About Fishes. Barnard portrayed King Richard III of England in the television series The White Queen on BBC One. Barnard also portrayed the character John Trenchard in a two part adaptation of “Moonfleet” that was filmed in Ireland. The drama, a biopic of Alan Turing, also stars Keira Knightley, Matthew Goode, Mark Strong, Rory Kinnear, Charles Dance , Allen Leech and Matthew Beard. One of Britain’s most extraordinary unsung heroes, Turing was the pioneer of modern-day computing, Turing is credited with cracking the German Enigma code and the film is a nail-biting race against time by Turing and his brilliant team at Britain’s top-secret code-breaking centre, Bletchley Park, during the darkest days of World War II. Turing, whose contributions and genius significantly shortened the war, saving thousands of lives, was the eventual victim of an unenlightened British Establishment, but his work and legacy live on. Starz announced today that the second season of the historical fantasy “Da Vinci’s Demons,” an original series created by David S. Goyer (“The Dark Knight” trilogy, Man of Steel, upcoming Batman vs. Superman), will premiere in the U.S. on Saturday, March 22nd at 9pm ET/PT. The ten-episode drama, produced by Adjacent Productions, follows the ‘untold’ story of the world’s greatest genius, Leonardo da Vinci, during his turbulent youth during the Renaissance. Starz greenlit “Da Vinci’s Demons” for a second season following its record-setting first season weekend debut on Starz on Friday April 12, 2013. Outside of the United States and English-speaking Canada, “Da Vinci’s Demons” is distributed internationally by BBC Worldwide, in partnership with FOX International Channels (FIC) who broadcasts the series to audiences in 125 countries in Latin America, Europe, Asia, the Middle East and Africa following Starz’s exclusive premiere in the U.S. Brilliant and passionate, the 25-year- old Leonardo da Vinci is an artist , inventor, swordsman, lover, dreamer and idealist. As a free thinker, with intellect and talents that are almost superhuman, he struggles to live within the confines of his own reality and time. Starring Tom Riley as the title character, season two of “Da Vinci’s Demons,” finds Florence thrown into chaos in the wake of the Pazzi conspiracy. Lorenzo is gravely ill and Leonardo da Vinci must push the limits of his mind and body to defend the city against the forces of Rome. While the Medicis go to unthinkable lengths to deal with new threats, da Vinci continues on his quest to find the fabled Book of Leaves and uncover the secret history of his mother. He’ll come to realize that he has lethal competition in his quest — new enemies who may be even worse than the forces of Pope Sixtus. His search will take him to faraway lands and force him to reevaluate everything he knew about the world and his own history. Riley’s co-stars include Laura Haddock, who plays Lucrezia Donati; Elliot Cowan, who plays the de factor ruler of Florence, Lorenzo Medici; Lara Pulver, who plays his wife Clarice Orsini; and Blake Ritson, who plays the ruthless and unwavering Count Girolamo Riario, nephew of Pope Sixtus IV. Jane Tranter, head of Adjacent Productions, served as Executive Producer. The series was shot in Swansea during the summer and fall of 2013. The series is produced by Adjacent Productions, a label launched in 2012 that sits alongside BBC Worldwide Productions in order to identify new and original programming created and produced under the company’s umbrella. If you’ve been wondering exactly what Alan Rickman’s been up to since he took off the curly wig and stopped checking the floor for dog mess as Hilly Krystal in CBGB, he’s gone back to what he does best. Buttoned-up and starchy men whose passions are buried far beneath a crusty outer shell of respectability. Look! He’s doing it here, in the trailer for A Promise, in which he plays Karl Hoffmeister, a somewhat stiff, but respected owner of a failing factory in pre-WWI Germany. Concerned for the future, he hires a young man called Ludwig (played by Game of Thrones star Richard Madden) to help take over his more energetic duties. The Musketeers creator and executive producer Adrian Hodges (Primeval, Survivors) introduces BBC One’s new adventure drama. 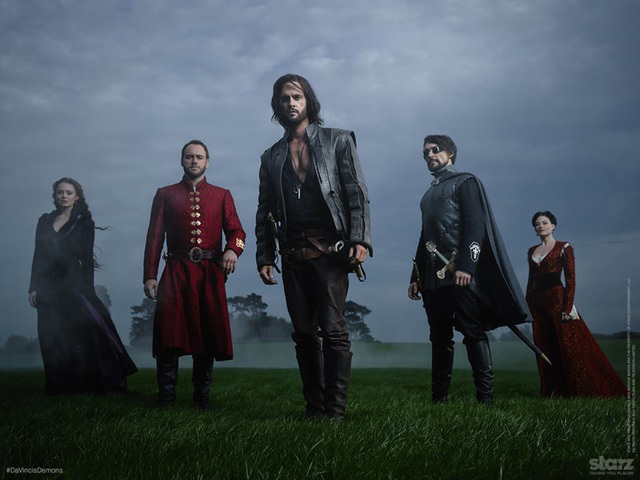 Launching this month, the ten-part drama series stars Luke Pasqualino (Skins) as D’Artagnan, Santiago Cabrera (Merlin) as Aramis, Tom Burke (The Hour) as Athos, Peter Capaldi (Doctor Who) as Cardinal Richelieu and Howard Charles as Porthos. “Our new series of The Musketeers is based on the famous characters created by Alexandre Dumas – D’Artagnan, Athos, Porthos and Aramis, some of the most evocative names in all fiction, names synonymous with adventure, heroism, courage and self-sacrifice. This new version is not an adaptation of the book, but rather a series of new adventures sometimes inspired by the novel, sometimes by the events of the period, and sometimes by more contemporary issues given a historical spin. “Why not attempt a new adaptation? Of course that was an option, but there have been many, many versions of the book’s justly celebrated story – some wonderful, some not so wonderful – and I simply felt the time was right to do something different with the founding myth of the Musketeers and to do what Dumas himself did with history – respect it, use it wisely, but also have fun with it. I hope Dumas’s spirit will forgive us the liberties we take in this new set of variations on the classic story he created; at all times we tried to be faithful to the spirit of his writing, though clearly not to the letter. “So why The Musketeers and why now? “It seemed to me that although the adventure genre, however broadly defined, has remained evergreen in the cinema, it had been a long time since I’d seen anything of this kind on TV, at least outside of the family slots and dark hybrid fantasies like Game Of Thrones. Have we as an audience grown bored with the ideas of courage, selflessness, romance and heroism associated with the genre? I seriously doubt it. “I suspect, and hope there is a serious appetite for this kind of material amongst the TV audience, something different to police and hospital shows (good as those often are), something that isn’t science fiction but which does take place in a world wildly different and infinitely more exotic than our own. “Perhaps the problem is that the whole notion of ‘Swashbuckling’ has become fraught with cliché and is full of traps for the unwary. Too often, swashbuckling has become a kind of code word for insubstantial characterisation, endless swordfights which have little or no consequence, and a kind of old-fashioned approach to storytelling which is dull and encrusted with period trappings and lame jokes. To put it simply, too often the adventure genre is lightweight and disposable. It just doesn’t have enough weight to captivate a modern audience that is perhaps more cynical and certainly more aware of storytelling tricks than any before it. “There are a number of ways to update the genre; you can take the mickey affectionately – as in Pirates Of The Caribbean – or simply transpose everything we used to associate with the swashbuckler and put it in a different genre, as with almost any of the Marvel Superhero films or most Westerns and space-set films. But what I wanted to do was take the genre seriously, provide everything the audience expects from it – period detail, sword fights, muskets, brave and romantic heroes and heroines, enormous risks, rescues at the last minute and so on – and also come up with something that felt, dare I say, relevant. “In other words I wanted to write something that wasn’t jaded or cynical, and which felt like it mattered, but which also felt modern, exciting and involving, while always trying to respect the conventions of the genre. I didn’t want to write something that was pastiche or satire, nor something that was po-faced and glum. After all, if The Musketeers isn’t romantic, action-packed fun, then what is it? “There are a number of ways to tackle the concept of modernity in a television adventure drama – Sherlock‘s successful updating is certainly one that stands out. But that kind of outright conversion to the modern era didn’t feel right for The Musketeers; I’m not sure the concept could really make sense outside of its original setting. “So right from the start I decided we had to keep the framework everyone knows but then bring a certain modern attitude to it, something that acknowledges all the conventions of the genre, while also playing with them, sometimes humorously but never in such a way that we fail to show respect. I love this genre; I don’t want to mock it. I just want it to seem as much fun to modern audiences as it did to me when I first saw Richard Lester’s wonderful version back in the early 1970s. “My most essential job was to look at the famous characters and give them a fresh look and feeling. Of course, all the characteristics we expect from these four famous names are here but hopefully in ways that will surprise and intrigue. It was a case of looking at the characters in exactly the same way as I would any others I try to create – who are they, really? What matters to them? What secrets do they keep? What world do they live in? What is the true cost of heroism? “It’s about making them people a modern audience readily recognises and understands: heroes, definitely, but heroes who are not straightforward, who are very human and who recognise that every time they draw their swords, someone, perhaps even them, might die. And die for real. “Above all I want these stories to matter to the audience; I want them to care passionately about the fate of our leading men and women, to feel invested. That way, the adventures our characters face really mean something, and every sword-fight, every ambush, every romance has real consequences in a world where there are enormous stakes to play for. But at the same time, humour is written into the DNA of these characters and I’ve tried very hard to honour that aspect of the original in ways that will please a modern, sophisticated TV audience without ever taking them out of the reality of the drama they’re watching. “The Musketeers is a drama – not a comedy, not a pastiche, not a pantomime. Everything about the detail of our world and our characters is as authentic as we can make it, because in the end, if an adventure doesn’t feel real, what’s the point of it?